Cornell experts lead hands-on summer program in grape-growing and winemaking [CALS Notes 2014-06-22] – Wine enthusiasts can explore the science of growing grapes and making wine this summer at the Cornell University Viticulture and Enology Experience (CUVEE) in Ithaca, New York, from July 27 to August 1, 2014. 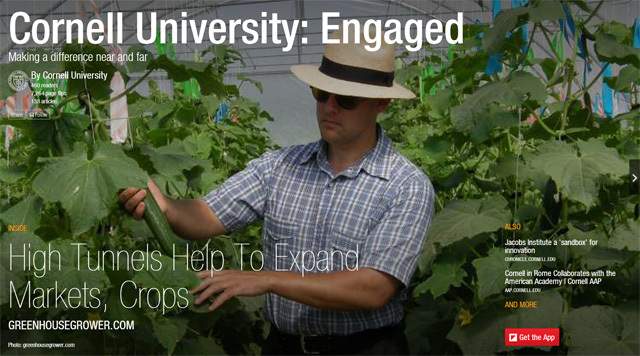 Cornell fruit-crop physiologist Alan Lakso and wine microbiology researcher Kathleen Arnink will mentor participants in the field and classroom. Inside Job: A New Chip Tells Farmers When to Water [Modern Farmer 2014-06-23] – Alan Lakso, professor emeritus in horticulture, Abraham Stroock, associate professor of chemical and biomolecular engineering, and Vinay Pagay, a Ph.D student at the time, created an electronic microchip water sensor that can be inserted right into grapevines. Pagay says the chips will soon start their testing rounds with Ernest & Julio Gallo Winery of Modesto, California. 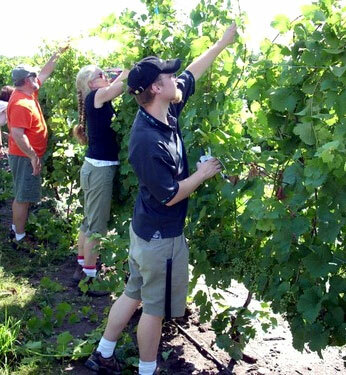 But the technology has a much broader use than just the wine industry. As the U.S. and other parts of the world labor under a record-breaking drought, the team hopes that their invention can help farmers who are coping with serious water shortages, or work in dry climate areas. New York looking at outstanding back-to-back apple seasons [The Produce Grower 2014-06-20] – “Last year, we had an excellent crop, a full crop, one of the largest crops in history,” said Jim Allen, president of the New York Apple Association in Fishers, N.Y. “This year’s crop is on the tree. Knock on wood, we had no frost damage.” Two new varieties, SnapDragon and RubyFrost, will be actively promoted this season. “They just really hit the marketplace last winter,” Allen commented. Cornell University, in partnership with New York Apple Growers, announced these varieties last August. 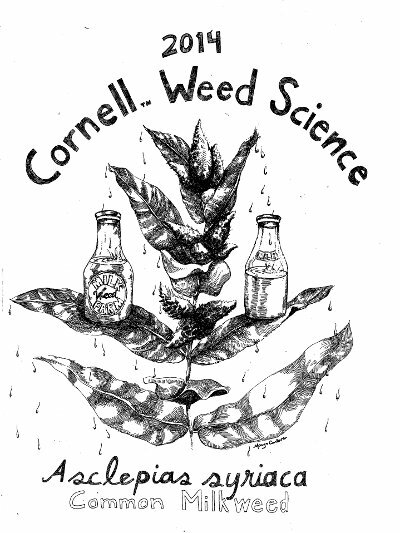 From Bianca Moebius-Clune, coordinator: Cornell Soil Health Initiative. 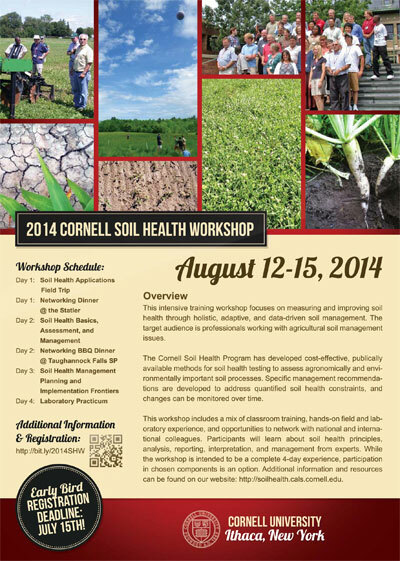 Join us for our 2014 Cornell Soil Health Train-the-Trainer Workshop to be held on campus August 12-15. This intensive workshop focuses on measuring and improving soil health through holistic, adaptive, and data-driven soil management. The workshop includes a mix of classroom training, hands-on field and laboratory experience, and opportunities to network with colleagues over meals. Our target audience is professionals working with agricultural soil management issues. A few logistical notes: Participation is limited to 45, first come, first served. While the workshop is intended to be a complete 4-day experience, we are enabling participation in chosen components this year to meet stakeholder needs. An Early-Bird discount is available until July 15, but some hotel blocks expire before this time. Registration deadline is July 30. 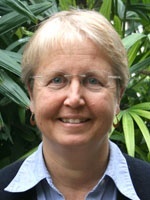 Please join with me in congratulating Laurie Drinkwater on her promotion to full professor. Laurie had an outstanding promotion package and those who read her materials will attest to the very high regard she has among her peers, not only in the United States but around the world. “I have a much better understanding of our entire operation from participating in the project,” said greenhouse grower Kendra Hutchins. Greenhouses are essential to hundreds of Cornell faculty and students who need to maintain and grow plants year round for research, teaching and outreach, especially in Ithaca. But, greenhouses are hardly green. This past year, staff and faculty from the Cornell University Agricultural Experiment Station (CUAES) worked with staff from Organizational Effectiveness to use the “lean” process improvement approach to save on greenhouse energy without diminishing the essential value of Cornell’s greenhouses. The energy currently used to heat and light 164 Ithaca campus greenhouse units – the largest noncommercial greenhouse facility in New York State – produces the same greenhouse gas emissions each year as do 2,642 passenger vehicles or 1,744 homes. The greenhouses off Tower and Caldwell roads total 144,624 square feet; and on a square-foot basis, heating a greenhouse costs $5 to $9.50 annually and lighting $3 to $6 annually. “Our efforts to save energy began with the greenhouse growers,” said Mike Hoffmann, director of CUAES and associate dean of the College of Agriculture and Life Sciences (CALS), referring to the staff-empowered approach utilized by the lean process. Can’t begin to use up that CSA share before vacation? 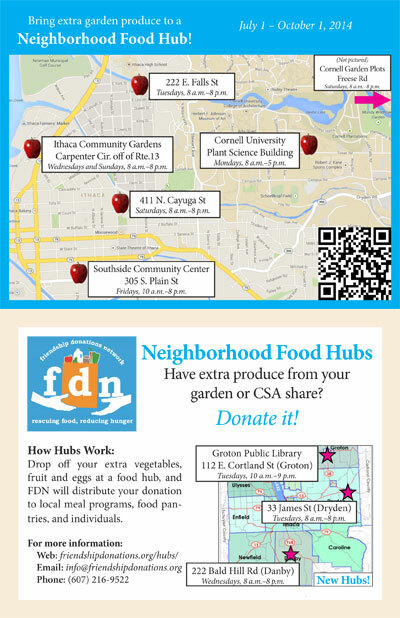 Donate your your extra vegetables, fruit and eggs at one of nine food hubs run by the Friendship Donations Network (FDN). Questions? Contact: Jane Mt. Pleasant jm21@cornell.edu or 607-255-4670. What is FDN? “We are a local non-profit, active for more than 20 years in Ithaca,” says Jane. “We rescue food and reduce hunger locally. We collect good, nutritious food that would otherwise be discarded and then redistribute it to food pantries and soup kitchens. “Don’t let your zucchinis grow up to be compost!” she adds. Quarter card with other drop-off locations in Ithaca and Tompkins County. Registration is now open for the 2014 New York Weed Science Field Day July 16. The day begins with a morning session covering vegetable crop weed control at the Homer C. Thompson Research Farm in Freeville, N.Y. In the afternoon, the action moves to the Robert B. Musgrave Research Farm in Aurora, N.Y. for the New York State Agribusiness Assocation Annual Summer Barbeque at noon, followed by a session covering field crop weed control. CCA and DEC Credits have been granted for both sessions. More information and registration forms. New this year is the Hill Harvests email list. 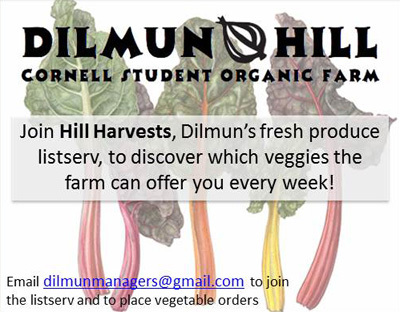 To be added to the list, send a message to the Dilmun Hill student farm managers at dilmunmanagers@gmail.com and they’ll send you weekly messages listing what produce will be available. You can also place orders in advance for pick up either at market or at the farm. The student farm managers also host work parties Wednesdays and Sundays, 4 to 7 p.m.
You may recognize senior Extension associate Judson Reid, inspecting high-tunnel cucumbers on the cover of Cornell University: Engaged — the first of a series of curated digital magazines on Flipboard, promoting themes that match to the university’s strategic initiatives. “Part of our strategy for building a presence on Flipboard stems from the fact that the mobile and desktop application has 90 million users who can help spread the good word about Cornell’s activities to broad and possibly new audiences,” writes Jeri Wall, director of writing/content strategy, University Relations/Marketing. 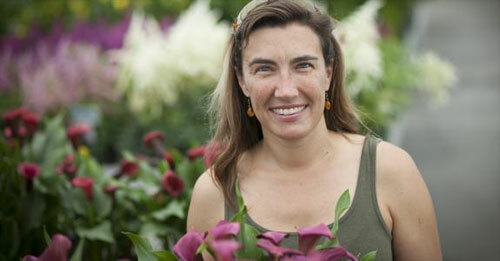 Have a good story about how you engage growers, communities and other stakeholders? I’d love to hear it. Contact me: cdc25@cornell.edu. 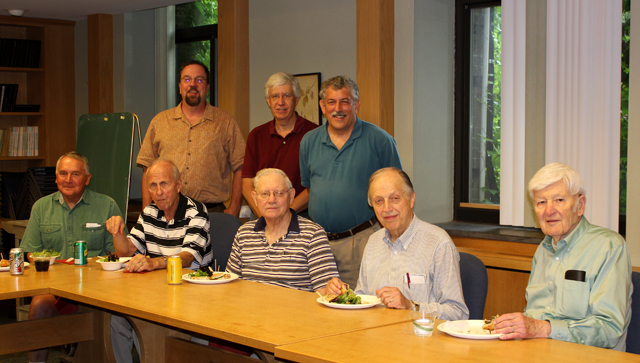 On June 11, a group of emeritus faculty gathered for food and camaraderie. They are (front) Bob Kozlowski, Robert Langhans, Loyd Powell, Elmer Ewing, and Edwin Oyer. Joining them, administrative manager Mark Schmitz, associate chair Steve Reiners, and chair Marvin Pritts. 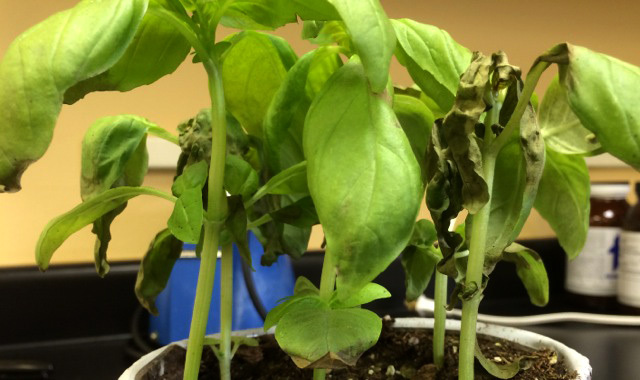 Reminiscent of the late blight outbreak of 2009, basil plants with downy mildew are being found at big chain garden centers on Long Island, New York as well as in Connecticut, New Jersey, Tennessee, Wisconsin, and several locations in Ontario. And I’m getting reports of the disease from gardeners, in some cases associated with purchase of locally-produced plants at local nurseries rather than big chains (one case here on Long Island). I’ve also gotten reports recently from Florida, Delaware, Virginia, West Virginia, Kentucky, North Carolina and a grower in Maine. Please be on the lookout for this disease. 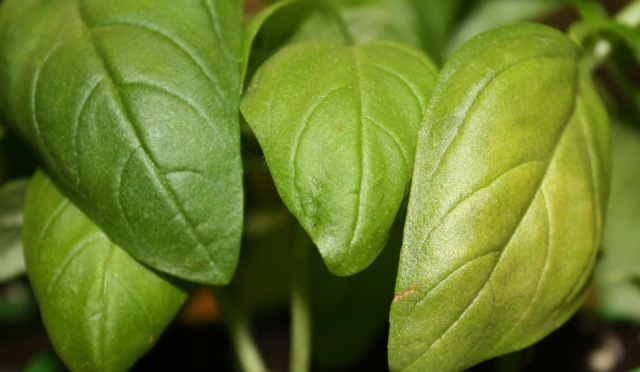 If you have an opportunity to visit a garden center to look at basil, I’d appreciate hearing what you see. State inspectors here are done looking in garden centers. 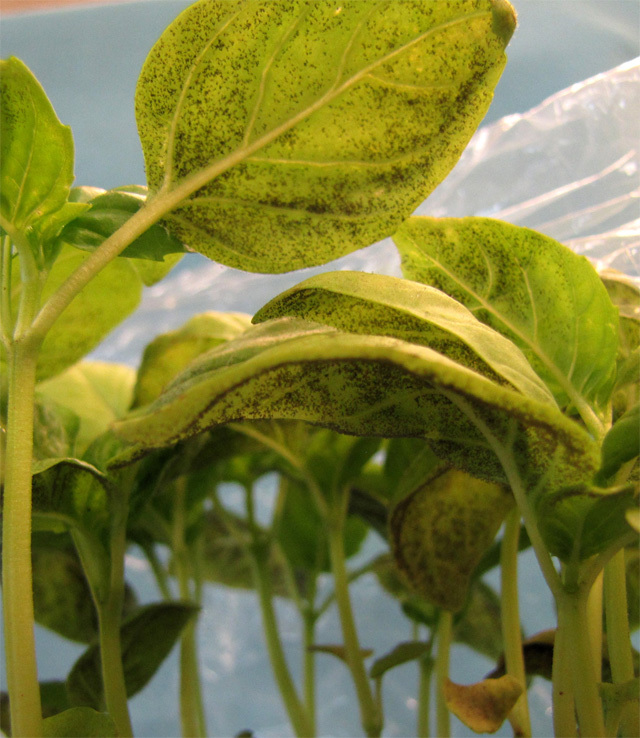 You can see more images on my Vegetable Disease Photo Gallery website. I also have more information and images at the Vegetable MD Online website.